Recently I was working with primary and secondary educators at a conference about leading organisational change. 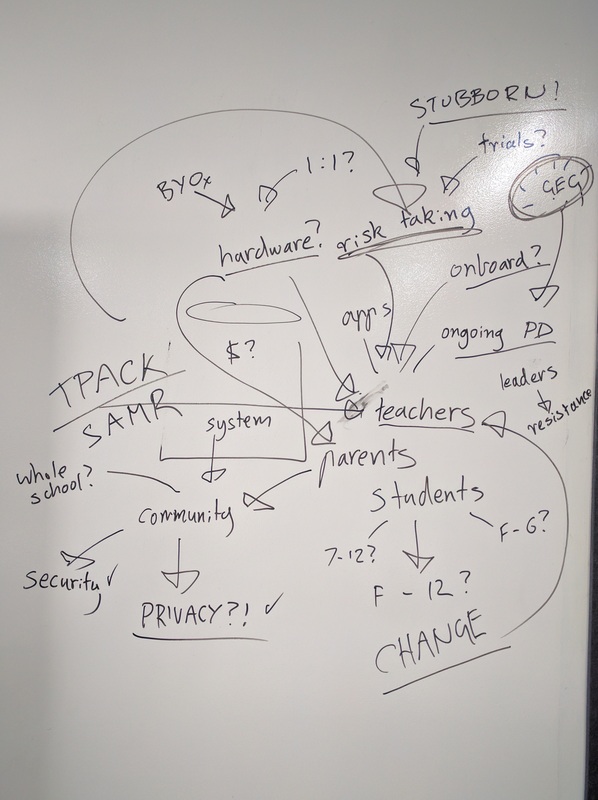 I usually start this workshop with a Socratic circle, asking colleagues to share their biggest challenge or obstacle towards adoption of technology in their school communities. As attendees rattle off bugbear after bugbear of their sticking points, I listen intently to their key messages and (attempt to) make connections from what they are describing by way of a mind map. Once everyone has had their say, I often take a deep breath before I admit a simple truth. There isn’t a silver bullet, a definitive recipe, or even a secret sauce for dealing with all of these challenges. As I have written previously, schools can be incredibly hard places to change, and at times, difficult spaces for re-imagination to take place. Technology itself often becomes the focus of anything that is to be supported or enhanced by technology, when the reality is that it is only just one piece of the puzzle. I use the diagram below in a lot of my workshops to illustrate the point that social capital makes up most of the equation, not technology. 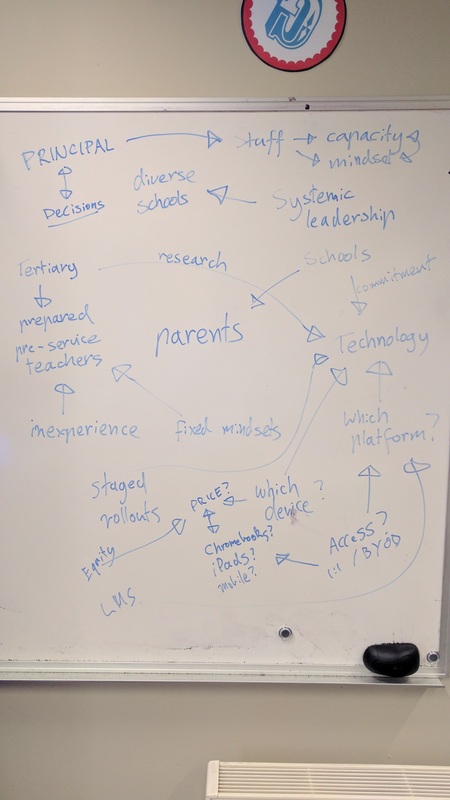 Driving change with technology can be particularly complex, and for some school communities, still not even well understood. Some of my favourite authors around change, leadership and re-imagining schools include Michael Fullan, David Price, Andy Hargreaves, Eric Sheninger, Guy Claxton, Clayton Christensen, John Kotter… and I could go on. But that’s not the point. Their ideas, frameworks, strategies and even research can indicate how to drive change in our schools, and what that can look like. Whilst their suggestions on what ‘works best’ can be taken as definitive, we should be mindful of the conditions of where and how it ‘works best’. Schools are incredibly diverse in their people, their needs, and their structures; and just because a strategy worked in my school with my team, doesn’t mean it automatically works somewhere else! One of the resources I suggest to educators who are interested in driving change in their school community is the Google for Education Transformation Center. It still surprises me how many school leaders I interact with who have not heard of this useful resource, even though it was announced last year. The Transformation Center is a hub of resources, materials and best practices to support schools in the change process. And whilst no magic secret sauce is offered towards transformation in schools, it does highlight success stories, case studies, and guides which have come from real schools that are driving real change. Under each of these themes, educators can find suggested strategies and questions for consideration that can serve as an individual reflection, or a great discussion springboard at a team meeting. There is also a resource directory where you can filter by ‘problems solved’, which contain the most common challenges reported by schools under each element of the framework, and gives related support material. Even though our schools are different, we often face the same challenges and opportunities. The Transformation Center is a great way that members of our profession can connect more widely with educators around the globe to realize that change is hard, but possible when coupled with certain strategies for certain conditions. In my opinion there is no generic secret sauce for change, because change depends very much on the purpose of change, the community context, and stakeholders at hand. However, The Transformation Center does reveal that through the power of a connection and sharing our practices, we can equip ourselves to move our agendas of innovation forward. If you have your own experiences of innovation and change, consider sharing your idea to the Google for Education team for inclusion of your story as a powerful resource. Educators, are you using the Transformation Center? 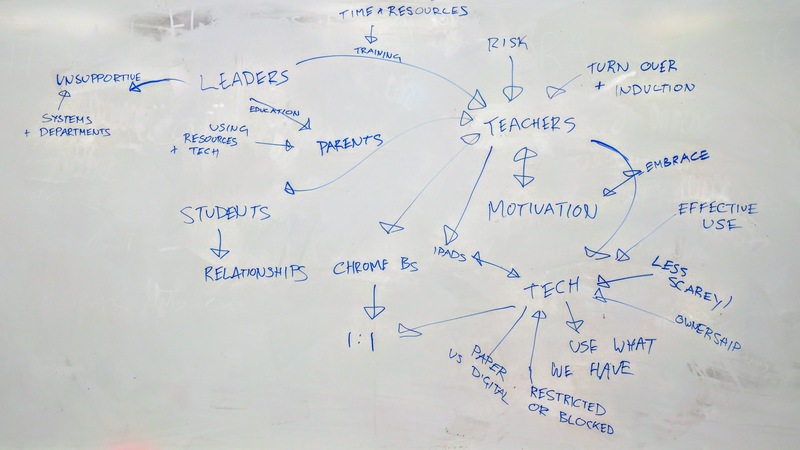 How might educators connect to drive agendas of innovation and change?